<**Organizations Using This Vessel:**Drathonian Spacy, Army. 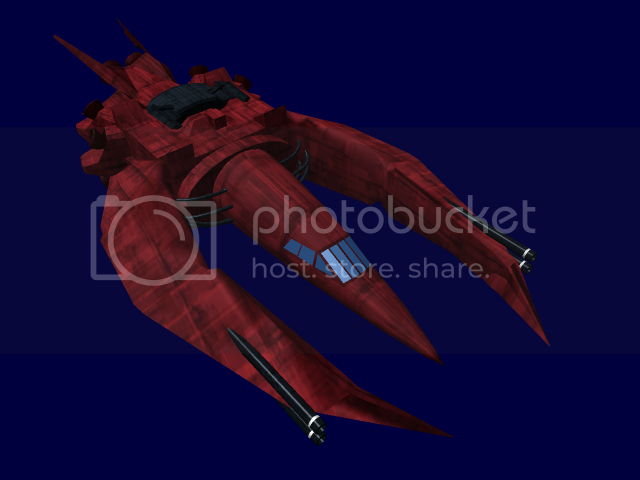 **Appearance:** A spindle shaped fuselage with claw like booms coming from the engine pod. The booms hold the ship's weapons and shields. suprisingly, the design gives a very clear view forward, upward and downward, but pereferal vision is quite blocked by the booms. The armor is made of some strange red alloy. Anything that can be slapped on, from ion cannons, to chainguns. The Rex was designed purely for fighter vs. fighter combat in response to the large number Terran fighters. Not much is known in detail about the Rexâ€™s origins. All that is known is from recordings of sightings by Terran vessels taken during scattered skirmishes. Since its first sighting, there have been an increasing number of Rex sighting throughout borderspace. (From wreckage recovered) The pilot sits in an almost laying down position with their feet pointing towards the nose. The pilotâ€™s head sits just a bit past the mid point of the craft. The walls of the cockpit are lined with several high tech devices [believed] to be used when in dogfights. The devices and computers crowd around the pilot chair making the cockpit feel like a coffin. The Rex fighter craft is covered in a armor made of an odd alloy (scientist still unsure of its origin) that has a reddish tint to it. Several electronic systems on board the craft. Most of the systems still remain a mystery as the systems were either to damaged in a dogfight to be of use, or they had fail safe that short circuited the system. Self-destruct-[One of the fail safes mention previously], after several crafts blew up upon recovery by naval forces, it is presumed that the Rex is equipped with a self destruct to prevent dratho tech from falling into the hands of the Terran Republic. 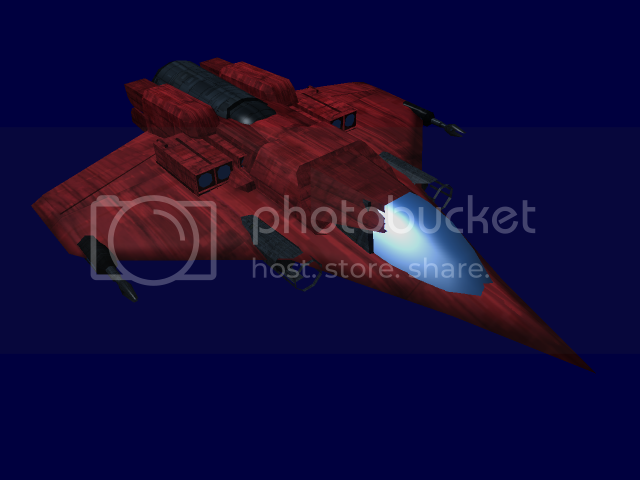 [Successfully] recovered wreckages showed a highly advanced air recycle system, which is much more advanced then other drathonian fighter crafts. (From record taken during combat) This craft seems to have relatively weak shielding systems, which can be disabled with one or two well places shots. Craft relies on speed and agility to avoid enemy fire. On most all of the craft we have seen the same basic complements of weapons.